A recent report from Nielsen has indicated that Internet use in South East Asia is on the rise. The study finds that not only is the internet growing in popularity but it is even out-shining the use of other traditional media channels such as TV radio and the print media. The study was conducted across six countries – Singapore, Thailand, Indonesia, Malaysia, Vietnam and the Philippines. The most important reason for this surge in usage of the internet is the increasing accessibility to broadband networks through Wi-Fi services, smartphones and other gadgets such as tablets, in addition to the continuing proliferation of traditional PCs in the region. 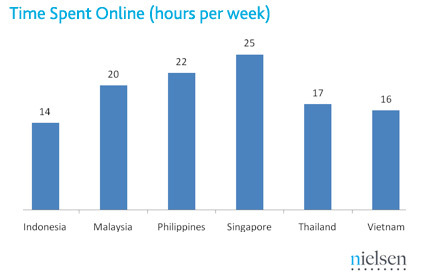 Users in Singapore were found to use the Internet the most among these countries, averaging about 25 hours per week. Among the other countries surveyed, Indonesians use the Internet the least, clocking an average of just 14 hours per week. While PCs (desktops as well as laptops) continue to be used, devices such as smartphones and tablets are starting to cut into their market share. In Indonesia, 78% of users have got Internet-capable mobile phones as compared to just 29 percent who owned notebook computers or 31 percent with desktops. While communicating through email is the most popular activity in Malaysia, Singapore, Philippines and Thailand, users in Vietnam and Indonesia were more interested in accessing the news. Social networks are also becoming quite popular in this region and expectedly Facebook is the dominant network here too. YouTube is also among the top 5 sites visited in these countries. Consumers in the region are also taking an interest in communicating with various brands online and often use the Internet to make decisions before purchasing any item. They also tend to post their own reviews later. However, online advertising is still not a very popular medium of communication in this region. However, with the increasing use of the Internet, online marketers should concentrate on this region as it can only be good for them in the long run.